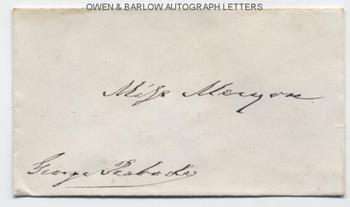 GEORGE PEABODY autograph Envelope Signed. American philanthropist, banker and entrepreneur. Autograph envelope, addressed to "Miss Morgan" in his hand and signed at lower left. Approx 4.75 x 2.75 inches. 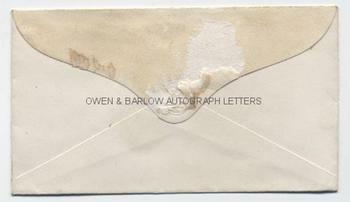 Some old mounting damage to flap of envelope on the verso but else in fine condition. George Peabody was born of a poor family in Massachusetts of Puritan ancestry. Through his mercantile abilities in dry goods and cotton trading and, subsequently, banking, he amassed a huge fortune. He used his considerable wealth to fund philanthropic ventures, principally in Britain (where he eventually settled) but also in America. His greatest achievements were in the fields of education and, particularly, social housing for the poor. He established the Peabody Trust in Britain and the Peabody Institute in America. The Trust still survives and continues in its charitable objects. George Peabody was much honoured during his lifetime and, at the age of 70, was invited to stand as a candidate for the Presidency of the United States (an invitation which he declined). He is generally regarded as 'the father of modern philanthropy'. The envelope is possibly addressed to one of the daughters of Lewis H. Morgan, the American pioneering anthropologist and social theorist.